Apple first announced its Retina Display 5K iMac two and a half years ago, one year before introducing a smaller 21.5 inch 4K companion iMac at the end of 2015. Providing the power of a desktop with the stunning design of Apple's light and thin MacBooks, the unibody all-in-one iMac line has become Apple's most popular desktop Mac model. Externally, 2017's latest 5K iMac is essentially unchanged from previous editions, apart from its two Thunderbolt ports shifting from TB2 (Mini DisplayPort jacks) to TB3 (using USB-C jacks). One minor change is the dual microphones at the top and back of the iMac being removed for a single mic that we couldn't find. It's said to be somewhere at the bottom of the machine, possibly in the vent. The mic is also no longer advertised as beamforming. On the 5K iMac, the Thunderbolt 3 ports can drive a single external 5K (5120x2880) at 60Hz with support for 1 billion colors (10 bit color), or two external 4K UHD (3840x2160) displays at 60Hz with support for 1 billion colors; or two external 4K (4096x2304) displays at 60Hz with support for millions of colors (8 bit color). The external monitor support works while also using the iMac's built in 5K display with its support for 1 billion colors via 10-bit dithering. Apple has also enhanced the 5K iMac display, which now delivers brightness of 500 nits (43 percent brighter than before). In addition to the two new Thunderbolt 3/USB C ports--which support both USB 3.1 Gen 2 devices (up to 10 Gpbs) and Thunderbolt 3 hardware (up to 40 Gbps)--Apple still provides four standard USB 3 ports, making it easy to plug in existing peripherals and iOS devices via Lightning cables without any adapters needed. Inside, however, there's even more that's changed. 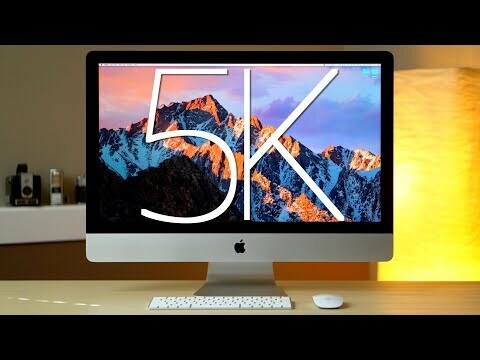 The entry level 5K iMac now provides Intel's 7th Generation Kaby Lake quad core Core i5 processor, which at 3.4GHz is notably more powerful than the 4th Generation Haswell Core i5 used in the original "Late 2014" 5K iMac, despite being clocked 100MHz slower, and an upgrade over the last Late 2015 5K refresh that used 6th Generation Skylake Core i5 CPUs clocked at 3.2 or 3.3GHz. Among other things, Kaby Lake can hardware accelerate HEVC/H.265, the advanced new codec Apple will be using in macOS High Sierra and on new iOS 11 devices to slash the file size of 4K videos in half. The newest Core i5 chips use the same 6MB of L3 cache as previous models of the 5K iMac. We tested the high-end model, which uses a 4.2 GHz Kaby Lake Core i7 which received a 200MHz rated base clock speed increase, jumping from Skylake to Intel's next-generation Kaby Lake chips, and boosting clock increase from 4.2GHz to 4.5GHz. That only tells part of the story, as under heavy quad core CPU usage the late 2015 iMac i7 wouldn't boost at all, while the Kaby Lake i7 processor turbo boosts 200MHz above standard rated speed. This offers efficiency improvements due to an architecture upgrade, and also a 400MHz higher clock speed under load. These improvements delivered a multicore Geekbench score of 19774 and single core score of 5736, scores which were 16 and 9 percent higher, respectively, than the previous high-end 5K model introduced last year (with scores of 16975 and 5263). While a decent improvement, that's not a jaw dropping benchmarking leap across a generation of Intel processors, underlining why Apple has increasingly focused on driving real world Mac performance through more efficient task scheduling and GPU crunched by the graphics processor rather than the CPU. Also note that over the same year and a half, Apple's custom designed A10 Fusion chip used in iPhone 7 delivered a CPU performance jump of 40 percent over last year's A9 and was twice as fast as the A8 chip that debuted in iPhone 6 -- alongside the 5K iMac in late 2015. Along with this power increase comes added heat, and for some reason a slower fan. The single fan that cools off both the faster processor and much faster graphics now spins at 2700RPMs, 150RPM slower than before. Interestingly the fan's noise is higher pitch and less annoying sounding than the previous fan, and slightly quieter with even with both fans at the same RPM. Previous iMacs would thermal throttle under extended 100 percent CPU load, and this year's machine is no exception. After about a 15 seconds of full load, the Kaby Lake iMac reached 99 celsius and slowed down from 4.4GHz to 4.3 and after a few more seconds was down to 4.2GHz. For the next 10 minutes of our test, it stayed at about 97 celsius and 4.2GHz, which is the rated clock speed. This is an improvement over the older model, which had to slow down to 3.8GHz to prevent from overheating. It's still disappointing, knowing that Apple has the capability to put in two fans to keep this machine running cooler, like they are doing in the upcoming iMac Pro. Thankfully, unless you transcode 4K video like we do, most programs including photo and video editing usually don't max out your CPU. And if they do, it's just for a split second. We edited multiple 4K videos for our YouTube channel and the computer never got hot enough to slow down, but it did get loud. While the 4K iMac is just getting dedicated graphics, the entry level 5K model enhances its existing GPU, moving from an AMD Radeon R9 M380x with 2 GB of video memory to an AMD Radeon Pro 570 with 4GB video memory. The new 5K iMac also offers an enhanced tier option with a Radeon Pro 580 with 8GB of video memory, which was in the unit we tested. This is the first time since 2010 that Apple offers desktop-class graphics chips inside of their iMac, and 7 years ago it was a low end card that was available. Thanks to the 14nm design of the Polaris graphics chips, the power draw is much lower than the last generation 28-nanometer AMD graphics allowing the use of desktop GPUs. The Base Radeon Pro 570 is actually faster than the best graphics card available in 2015. Many people complained about stuttery user interface with the previous base graphics, and that was likely because of the measly 2GB of video RAM, which is taken up by the roughly 15 million pixels of the 5K display leaving almost nothing for programs to use. Anyone that was serious about video editing or other productivity or creative software had to spend extra to get that 4GB graphics card, where they no longer do. Of course we do recommend upgrading to the best graphics for those tasks, but it's no longer a requirement. The new star of the show is the 8-gigabyte Radeon Pro 580 which was 75 percent faster in the Final Cut X benchmark BruceX completing the render in just 15.5 seconds, compared to 27 seconds with last years model. In our real-world video editing tests with Final Cut Pro, our Kaby lake all in one was between 21 percent and 80 percent faster depending on the task (with more difficult tasks getting a bigger performance improvement), which does make a noticeable difference in day to day work. Apple historically hasn't been known to be a good option for gaming, but with these new desktop grade graphics chips, we decided to put our 5K iMac to the test playing Battlefield 1. The Radeon Pro 580 is based off of the RX 580 which is known to be a respectable gaming card, and it doesn't disappoint here. Since Apple choose 5K because of its perfecting scaling of double 2560x1440 resolution, gaming at 1440P looked great with no weird image issues that you often get when running at a lower resolution than intended for the display. Setting all the graphics settings set to the absolute maximum (ultra preset), Battlefield 1 ran between 50 to 70 frames per second, with the vast majority of the time staying above 60 frames, which is perfect for this display. This great performance along with with the quality of the image really surprised us, and even though the fans did kick up to a high settings after about an hour, there was still enough cooling headroom so extended gameplay shouldn't present any issues. As previously, a dedicated gaming PC is still a better value than an iMac, but for the many like myself who want to use this machine for productivity but wouldn't mind spending a bit of time relaxing after work, you won't have any issues. This is really the first time that we can say you can happily game on Apple's most popular desktop and have a high-quality and smooth experience. A "best configuration" 5K iMac with a Core i7, 32GB RAM and the best graphics option would have cost $3,399 in the previous generation, but is now priced $100 less despite the 2017 model providing faster graphics, a Kaby Lake CPU, faster RAM, double the entry-level SSD capacity and Thunderbolt 3. Across the line, GPU options have been updated so now the base 4GB GPU is faster then the previous best GPU option. Thus, a new, "better tier" 2017 5K iMac priced at $2,399 will outperform the previous generation 5K iMac that cost $2,799. The "best tier," high performance tier outperforms the Late 2015 5K iMac at a price that's $400 less expensive. That means you can splurge on the high end to double your SSD storage and video memory to significantly improve graphics performance and still come in $100 less than the previous 5K iMac, featuring the best graphics and processor options. While faster overall in many ways, the new 4K and 5K iMacs are designed with the particular objective of being useful for advanced graphics development. Apple recommends its 5K iMac with Radeon Pro 580 graphics for 3D VR content creation and immersive 360 degree video editing--a feature it is adding to Final Cut Pro X later this year, apparently based on the hiring of 360VR Toolbox developer Tim Dashwood. All three 5K iMac options also now use a faster RAM architecture: 2400MHz PC4-19200 DDR4 (compared to 1867MHz PC3-14900 DDR3L in the previous generation). The new 5K models support upgrading from the standard 8 gigabytes to 64 gigabytes. Their RAM is socketed, and unlike the 21.5-inch models, the 27-inch iMacs provide easy user access to memory upgrades, and supply four RAM slots rather than only two. The new iMacs also now support Bluetooth 4.2, which Apple began incorporating on its iOS devices in 2015, starting with iPhone 6 and iPad Air 2, and continue to supply a Gigabit Ethernet port and a SDXC slot for digital photographers. The more expensive 2017 5K iMac tier provides Apple's faster SDD-accelerated 2-terabyte Fusion Drive--along with all the other improvements detailed above (including the better Radeon Pro 580 GPU and a bit faster 3.8GHz Core i5)--is now priced at $2,299. All three 5K iMac tiers are essentially at the same prices as the previous 5K iMac models they replace. While much faster than a conventional hard drive, Apple's Fusion Drive (a hybrid 1-terabyte hard drive with 32 gigabytes of SSD cache) might not be fast enough for doing higher end workloads. Upgrading the base model 5K iMac to a full SSD costs $100 for 256 gigabytes, $300 for 512 gigabytes and $700 for a 1-terabyte SSD. Thunderbolt 3 connectivity also enables pro users to attach external SSD or RAID storage for working with video. Another built-in alternative that's less expensive--and offers far more capacity than is affordable via pure SSD--is going with a larger Fusion Drive. Apple's 2-terabyte and 3-terabyte Fusion Drives incorporate 128 gigabytes of SSD cache, as $200 and $300 options, respectively, although they are only offered on the better and best model tiers. Apple actually recommends that an iMac with 32 gigabytes or more RAM "should be configured with a 2-terabyte or larger Fusion Drive or all-SSD storage." The highest tier 5K iMac can be upgraded to a 4.2GHz Core i7 upgrade option for $200, while a RAM upgrade to 16GB costs $200, moving to 32 gigabytes will set you back $600, and 64 gigabytes of RAM costs $1400--although less expensive upgrades and DIY kits are available from third parties. Apple's $1,799 entry level 5K iMac supplies a 1-terabyte Fusion Drive. Upgrading it to a 2-terabyte Fusion Drive costs $200, the same price as the middle tier -- which supplies a slightly faster CPU and GPU in that price. The $1,999 model also offers other upgrade paths, including a 4.2GHz Core i7 upgrade option for $300 and a 64GB RAM upgrade (still $1,400) and both a 2TB and 3TB Fusion Drive (for $200 and $300, respectively). All models can be ordered with Apple's Magic Trackpad 2 instead of the standard Magic Mouse 2 for $50 more, or you can get both pointing devices for an additional $129. Also new this summer is Apple's wireless Magic Keyboard with Numeric Keypad, sold separately for $129. Alongside its Retina 5K iMacs, Apple also offers a refreshed, non-Retina (1920x1080) 21.5-inch iMac with a 2.3GHz dual core Kaby Lake CPU and Intel Iris Plus graphics, a faster LPDDR4 RAM architecture and Thunderbolt 3, with a standard 1TB hard drive for $1099. Apple also upgraded its 21.5 inch 4K (4096x2304) iMac with Kaby Lake CPUs ranging from a 3.0GHz Core i5 7400 to a 3.4GHz Core i5 7500; GPU options of the Radeon Pro 555 with 2 gigabytes or Radeon Pro 560 with 4 gigabytes; and RAM upgrade potential to 32 gigabytes using just two slots (that are not user accessible). The 4K model tiers range from $1099 to $1499. The latest Kaby Lake iMacs deliver strong refinements to Apple's most popular desktop Mac line. Later this year, Apple will introduce at even higher end iMac Pro that goes even further, albeit at a premium price, starting at $5,000. The 5K Mac models deliver performance improvements at a better price than previous models, although we recommend users opt for at least the middle tier (or upgrade their Fusion Drive to the more SSD-rich 2TB or larger options). However, for mainstream graphics, video and office users who play video games -- and others living in the iMac sweet spot -- the Kaby Lake generation of iMacs offers a great lineup for new buyers to jump in or a strong upgrade for users looking for faster, sustained performance in a great looking package with a breathtaking display and strong connectivity features. Adorama is exclusively offering AppleInsider readers an additional $75 off each and every Mid 2017 27-inch iMac 5K configuration with promo code APINSIDER (this is on top of Adorama's already reduced pricing). What's more, shipping is free on the new iMacs, and Adorama will not collect sales tax on orders shipped outside NY and NJ. For shoppers outside those two states, that can mean $235 to $515 in savings compared to paying full price with tax at the Apple Store. And according to our 27-inch iMac 5K Price Guide, these are the lowest prices available from an Apple authorized reseller. To redeem the coupon, please see the step-by-step instructions below. * Price with coupon code APINSIDER. Prices in red reflect total savings off MSRP. Adorama will not collect sales tax on orders shipped outside NY & NJ. So, the headline is basically "Desktop impresses with desktop-class graphics" ... am I missing something here? That seems like a really low bar for being impressed with something. It is mind-blowing an unexpected that they actually released a Magic Keyboard w/ Number Pad. I know people have moved on to thinking about Touch Bar and Touch ID on the Magic Keyboard, which I don't believe they are doing for security reasons. But why can't desktop users have the advantage of a backlit keyboard? Yes I wish it was backlit as well...I very often use my Mac at night in the low light conditions. Battery life pure and simple. The battery in that new keyboard can’t be all that big. If it had backlighting you’d both probably be complaining about having to charge it every few days. IMHO of course. No offense, but I'm a bit confused by how anyone in 2017 can still not be able to touch-type. This machine is on my list for the Fall (barring any other updates of course). My late 2013 iMac 14,2 runs Sierra very fast. It’s just time. I usually go five years between new machines but this one looks really good. Past iMacs had mobile GPUs, not desktop graphics. It is not only "sold separately" -- it is also sold with the iMac BTO. If you hit "change" under Keyboards during checkout, there is a full selection of Magic Keyboards with Numeric Keypads for $30 more. I have the late 2015 with the 395x. Can anyone tell me how much faster the new Radeon Pro 580 with 8GB is? I played with the top end 27" iMac at the Apple store over the weekend and I will definitely be purchasing one to replace my 2009 iMac when the new OS comes out in September. For the money I thought the top end price was very reasonable for the specs/performance and 3Tb fusion drive. I'll probably save about $600 going with OWC 64Gb memory as I have used them before with good results and they have a lifetime warranty. This is the best new Mac/iPad lineup in years in terms of price:performance - this is definitely the year to upgrade if one has been holding back. That's a reason to no longer be disappointed, not a reason to be impressed. Have I spotted a mistake? I read the whole article carefully. It said "While the 4K iMac is just getting dedicated graphics". I don't think that's correct. Both 4K iMacs get Radeon Pros. It's only the low end iMac that uses Intel Iris Plus graphics. Ahhhh. The phrase "is just getting dedicated graphics" means "is JUST NOW getting dedicated graphics" not "just getting some inferior graphics". So the article is not wrong, but just hard to understand. Usually when I see the word "just" it means "only" not "suddenly". Then why have backlit keyboards on MacBooks? ive been typing for 20 years and there are still some keys I need to see to be able to use properly. I missed where Internet law was passed requiring anyone using a computer to be a touch-typist. For budget concerns I elected to get a Late-2015 27" iMac refurb for $1500 instead of a 2017 model. I'm liking the 2017, but not enough for the price difference. Had I more disposable cash, sure. Bought a top of the line unit to replace my 2009 iMac. Sold by the numeric keypad. Have a mismatched one right now, and eliminating batteries is something I am looking forward to.